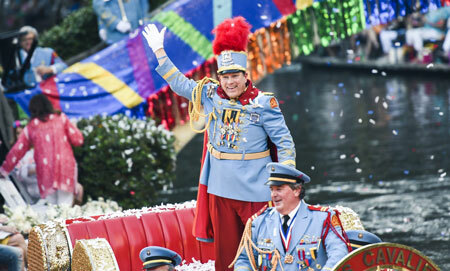 There’s nothing quite like the Texas Cavaliers River Parade. Festive music fills the air and vibrant floats pass by as thousands watch from the banks of the San Antonio River. This one-of-a-kind parade started in 1941 after a group of Texas Cavaliers witnessed boats and barges decorated with flowers in the “floating gardens” of Mexico City. This coincided with the San Antonio River bend restoration, and the Texas Cavaliers decided to bring this unique experience to our city. The first Texas Cavaliers River Parade included a number of boats for schools, local businesses, civic organizations and the army. Texas Cavaliers and the parade sponsors decorated every float with bright flowers and vibrant colors, and the tradition of the River Parade began. 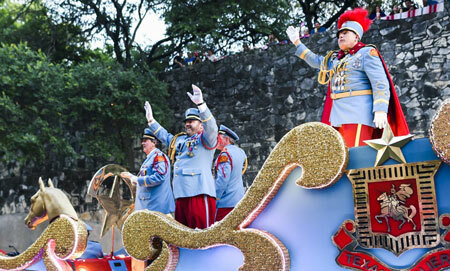 Seventy years later, the Texas Cavaliers still decorate the San Antonio River with the bold colors of Fiesta. 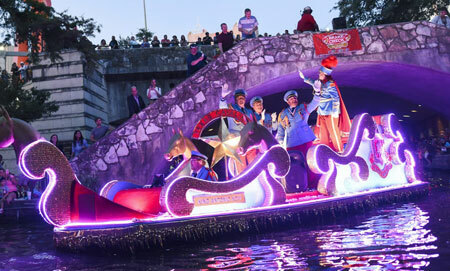 The Texas Cavaliers River Parade has found its way into the hearts of over 250,000 spectators each year, and all money raised supports local children’s charities through the Texas Cavaliers Charitable Foundation. The River Parade comes to life 7-9pm on the first Monday of Fiesta each year in April. The Texas Cavaliers only have 18,000 reserved tickets available, so don’t miss your opportunity to be front and center for the most unique parade in the country.